The image shows a fan titled ‘The Great Exhibition of 1851’, made probably in England, in occasion of the event it gets its name from. 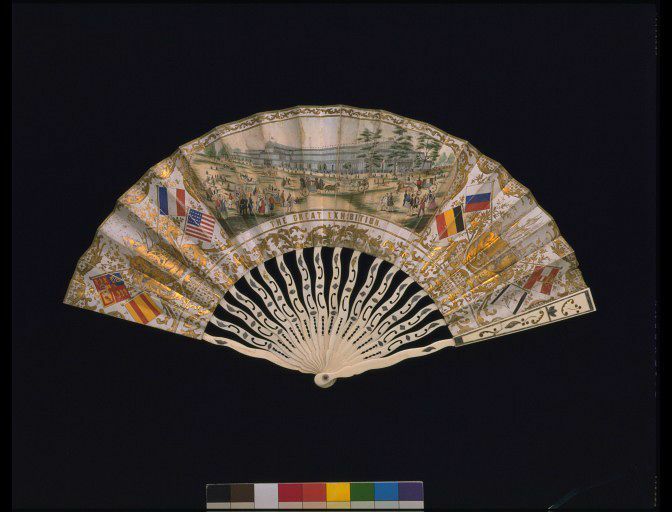 The fan is made of hand-coloured printed paper with pierced bone sticks and guards inlaid with silver. It portrays a view of the façade of the Crystal Palace, flanked by flags of various nations. The reverse is printed in gilt with vignettes of female silhouettes alternating with coats of arms. 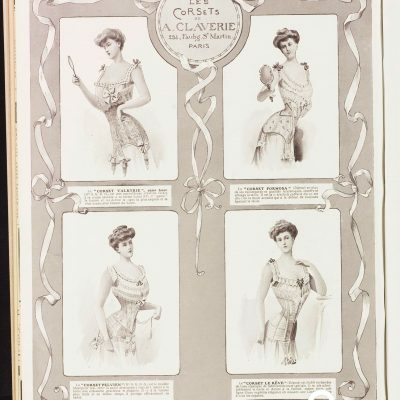 The objects is a material memory of one of the most studied and discusses events of modernity: The Great Exhibition of the Works of Industry of All Nations, usually simply referred to as The Great Exhibition. In 1851, thanks to the intuition and interest of Prince Albert, London became the theatre of an unprecedented spectacle, turning industrial practices into one of the most important progress of human mind. The Great Exhibition, the first ever international exhibition of its kind, was a magnificent display of manufactured products, hosting an incredibly wide set of objects from all fields: from steam engines, to technologies and products developed in different regions of Europe, to exotic goods from the British empire and beyond. An ephemeral and grand architecture – a temporary ‘Crystal Palace’ designed by Joseph Paxton – was itself the result of the latest techonolgical advances in glass and iron manufacture. The Great Exhibition took place in Hyde Park, London, from 1 May to 15 October 1851. It was estimated that six million people visited it.